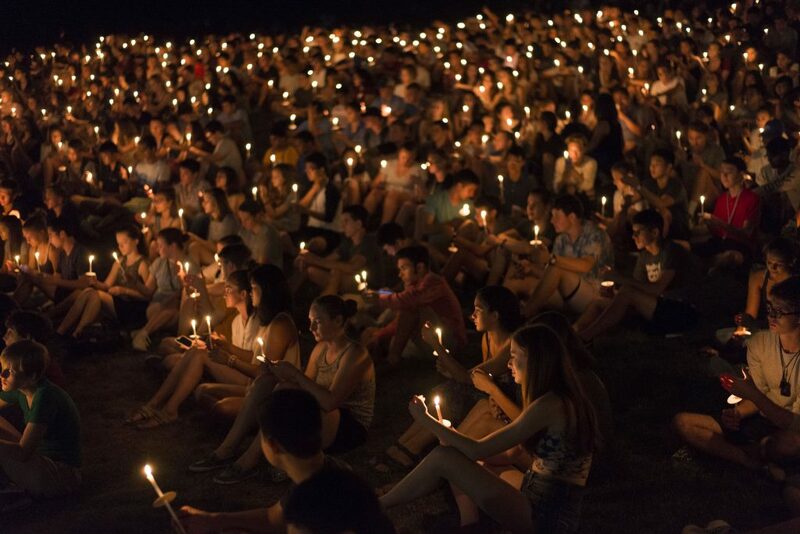 Over 1,600 first-years and transfer students gathered on the President’s Lawn on Saturday night to participate in Tufts’ Illumination Ceremony, according to University Chaplain Reverend Greg McGonigle. The candle lighting ceremony — an undergraduate tradition meant to symbolize university benefactor Charles Tufts’ mission to “put a light” upon Walnut Hill, according to McGonigle — was organized by the University Chaplaincy. Speakers from across the Chaplaincy spoke during the hour-long ritual, including Muslim Chaplain Celene Ibrahim, Buddhist Chaplain Priya Sraman and McGonigle. Each spoke about the tradition of light within their respective faiths, tying that theme back to the candles given to the students as part of the ceremony. Upon the speeches’ conclusion, alumni speaker Sofia Estrada (LA ’18) lit the first candle, which was then spread from candle to candle until the entire hill was alight. The a cappella group S-Factor sang as the candles were lit. This was the third year that the University Chaplaincy was in charge of organizing the Illumination Ceremony, according to McGonigle. “The orientation committee asked us if we would look at the Illumination Ceremony again with fresh eyes and bring it back to the heart of what it’s supposed to be about,” McGonigle, for whom this was his sixth Illumination Ceremony, said. Part of that “reimagining,” as McGonigle called it, came through integrating diverse traditions — religious, philosophical and cultural, among others — within the ceremony. McGonigle pointed to the candle’s light as a universal symbol. McGonigle noted that this year’s ceremony rearranged the order of events such that the alumni speaker, Estrada, went immediately before the candle-lighting began. McGonigle said that in years past, the alumni speaker went first. McGonigle described the Illumination Ceremony as an important way to kickstart the Class of 2022’s college career. It is one of the few class-wide rituals that Tufts students participate in, according to McGonigle, and a crucial community-building activity. The ceremony came at the end of orientation week, days before the class of 2022 began the 2018-2019 academic year. Incoming first-years are spread across Tufts’ undergraduate schools, according to a Tufts Now article on Aug. 29. The vast majority — 1,200 students — enter the School of Arts and Sciences, while 249 enter the School of Engineering and 95 more in the School of the Museum of Fine Arts at Tufts. This year’s class was chosen from Tufts’ largest applicant pool in history, according to the article. The university received 21,501 applications and accepted 3,143 of them. The 14.6 percent acceptance rate is Tufts’ second-lowest ever, the article noted. University President Anthony Monaco introduced the incoming students to Tufts during the Aug. 29 matriculation ceremony.